Our goal is to breed typical, stable and healthy Kerries well suited to be loved companion dogs. Some of them can turn out to be successful showdogs. Some can, in the right hands, be skilled in agility or obedience. Breeder Zuzana Szovenyiova, Slovakia. Owner Rollick's. Kennel Rollick's have been active for 25 years and has during the last 15 years been the leading Kerry kennel within Sweden. 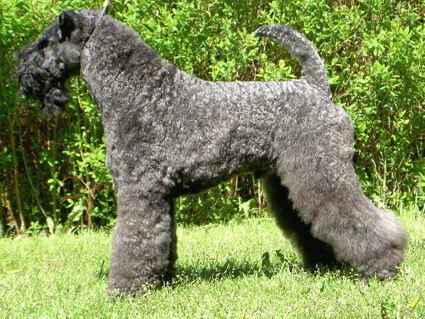 We are very proud of Am & Can Ch Rollick’s Riverdance, the Top Winning Kerry Blue in USA 2006. Her son, Ch Symphonie's Be My Valentine, was won numerous BIG's and BIS's during his time at Rollick's and finished as No 3 Top Dog all breeds 2007. We are also breeding Shiba & Irish Softcoated Wheatenterrier. S Ch Rollick's Wild Fantasy. We are hoping for new Kerry babies. S Ch Rollick's Girl Power is bred to S Ch Rollick's In the Spotlight. Hero was BIG and BIS-3 at Koping Int. Hero was BOB and BIG-2 at the World Show, only beaten by the Sealyham that won the BIS! 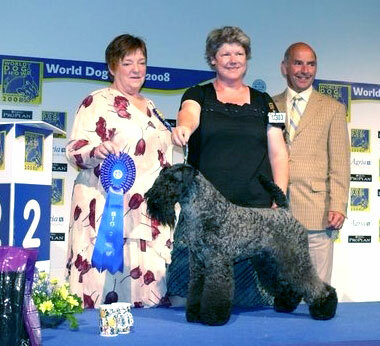 Cecil was Best Junior both at the World Kerry Spaciality and World Terrier Speciality, also BIS-2-junior. Rollick's Apocalypse was BIS-puppy at Norrköping Int. Hero won the group at the same show. Rollick's Fly Me Two the Moon has won two CAC at his first two shows. Int Ch Rollick's Fame'n Glory got her puppies. Ch Rollick's Bombalurina got her puppies. Ch Rollick's Wild Thing got her puppies. New pictures of Loris pups. Ch Rollick's Magic Light finnished her Int Championship. New Champion! Rollick's You Go Girl in Australia finished in grand style. The Shiba Explorer's Lurime got four boys and one girl! Kerrydom Court Hero at Rollick's won CAC, BOB and BIS-3 at the biggest terrierspeciality in Sweden. Also New Champion. Ch Symphonie's Be My Valentine won the group at Sundsvall Int. Ch Remus Braudag and Ch Rollick's Wild Thing was BOB and BOS at Ekero, FInland. The Shiba Ch Explorer's Lurime was BOB.. The Wheaten Lindywheat's Tiramisu got three boys and three girls! Ch Symphonie's Be My Valentine sired a liter of six girls and one male at Occis kennel. Ch Symphonie's Be My Valentine was BIS-2 at Almare-Staket. Int Ch Rollick's Fame'n Glory was BOB at Veijen Int Jubileee show in Denmark. Ch Remus Braudag was BOS. Thank you Agneta for all help!